« 2 Weeks Without Lomotil… Still Good! 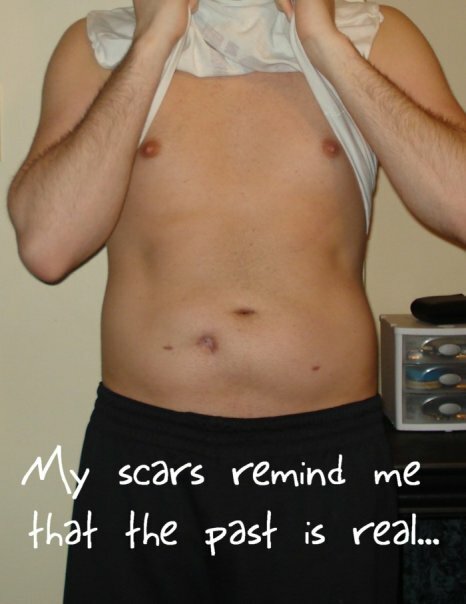 I remember when I had first heard about the procedure, all I could think about was what my stomach would look like with a scar going down my entire torso. It was terrifying and as a gay man who was 22 years old, I had thought that it would ruin my idea of a beach body. I would never have the smooth, chiseled so greatly desired and admired by other gay men. I would never be able to let someone rub my stomach, without thinking they were wondering what the heck that thing was. But after a little bit of research into the surgical options, I found that there was a way this procedure could be done laparoscopically. It was an immediate interest for me, and I’m vainly ashamed to admit, it was a big part of me being able to decide on going through with the surgery. I had first seen pictures of the laparoscopic procedure on Mark, from Jpouch.net. I had thought that it looked great and hardly like a major surgery had been done at all. Seeing those pictures gave me a lot of comfort. Further research found me a doctor at the Cleveland Clinic in Ohio, where I eventually went through the surgery. I remember the night before the surgery, as I was brushing my teeth, I stood there and stared at myself naked in the mirror for about 20 minutes. I looked over every inch of my body to memorize any changes I might see in the future. I rubbed my hands over my torso to feel the smoothness. 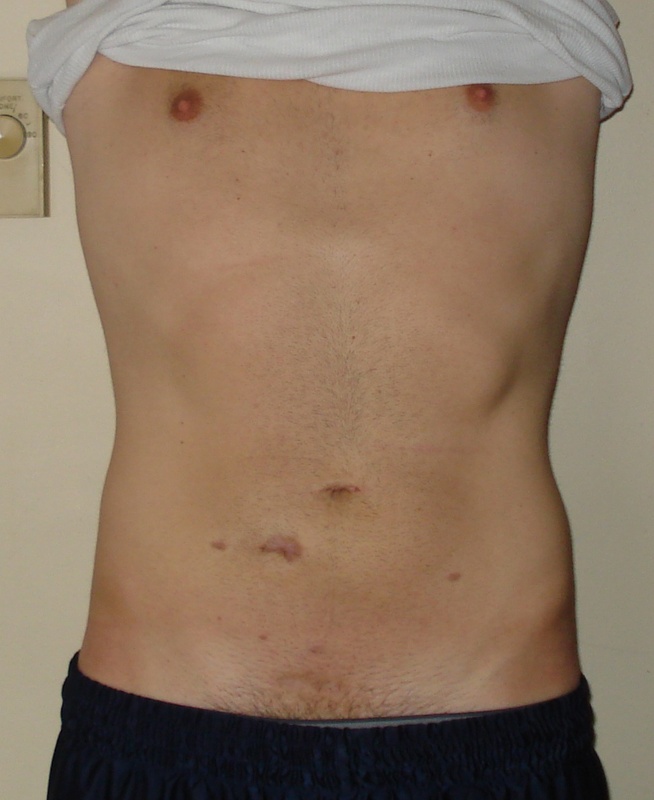 I tried to imagine the big scar, and then think how lucky I was to be able to have it done laparoscopically. I thought about whether I was going to be comfortable taking my shift off, or whether I would have a shred of doubt as to where people might be staring. Then again, being sick took me out of shape, and the prednisone made me gain weight, so would I even feel comfortable having my shirt off in my current state anyways? I didn’t think so. Towards the end of my self-pity mirror session, I suddenly got a bad cramp and had to head to the toilet for one of my frequent bowel movements. That moment right there assured me that no matter what the aesthetic cost, getting rid of the damn disease was worth it! As I write this one year later, the thoughts of those scars are completely out of my head. I was pre-occupied with the ostomy for 3 months, then pre-occupied with the healing of the wound for another couple months after that. I had used Mederma, but didn’t find that it helped all that much. Maybe I should do it in another year, when the scar is considered ‘old’. I had a fabulous summer, and I was shirtless for most of it, just showing off my scar as an advertisement of what I went through and what I survived. I even get a little entertainment out of it, because it’s so funny to see people’s faces when you tell them you got stabbed in a gang fight. Or you got shot while trying to save an old woman from a stray bullet. Or you have a second belly button. Or you had an ‘I ❤ Mom’ tattoo removed. You can create your own story, and make it as far-fetched as you want, because no one else is going to recognize those scars, besides a fellow j-poucher. As far as me, I still rub my hands over my torso all the time, and even though it’s not totally smooth, it’s painless and it’s a feeling of self-accomplishment. I often think about getting a tattoo arounds the scars as a symbol of what I went through, but I can’t even begin to think of what I would put there. Plus, I like it just the way it is, and I wouldn’t trade it in for a set of six-pack abs (okay, maybe I would, hahaha).